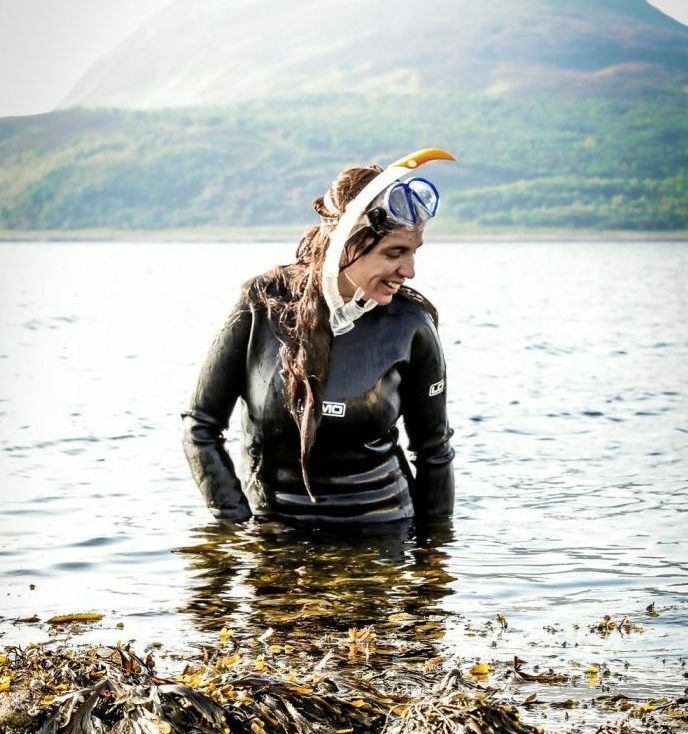 This is the second part of the Sealives Initiative piece on Manuela de los Rios and her work with COAST, on the Isle of Arran, Scotland. Please see Part I of this story here. Anyone who has tried to converse with a government agency, especially one that appears underfunded, knows that dealing with these bureaucracies is an exercise in frustration management, and COAST has experienced much of the same. Manuela says the community looks up to COAST as stewards of the NTZ and, when issues like the “Creel Incident” arise, members of the community look to them for answers. She says it is tough when the community have been engaged and trying to be helpful and then COAST cannot address their concerns. They want to be able to respond and tell them the situation, what happened; to show them that their reporting helped accomplish something good. The red tape and classic run-around COAST has received surrounding getting any information makes it hard. No one likes to have to tell those who look up to them for answers that they simply have no more information. This brings up one of the key issues COAST has come up against. There is a cultural, almost cognitive belief held by many regarding the stewardship, the ownership if you will, of the sea. This is an important point. Just like terrestrial land does not only belong to farmers and foresters, neither is the ocean the sole property of those who take fish from it. And it is well worth the fight to make sure policy- and law-makers understand this, and understand that we know it. Manuela tells us there is a big difference between what happens in Scotland and what happens in England. England has the Inshore Fishing and Conservation Authorities (IFCAs), a group of ten districts that cover the English seas out to six nautical miles from shore. These IFCAs are made up of a diverse group of stakeholders, including not just fishermen, but also scientists, government officials and conservation groups, who decide together how to manage their seas. As Manuela tells it, RIFGs are, “just the fishermen and the government. So, obviously the commercial fishermen have a very strong lobby on what happens. And they have no space for other stakeholders to have a say on how the fisheries are managed.” COAST clearly does not agree with the current system, believing there should be much more democratic representation of stakeholders that make these important decisions. Having committed, passionate and determined individuals is one of the most important keys to success. The essence of what has made COAST successful is the people who have been ready and willing to make personal sacrifices to ensure its success in the face of many obstacles. Talent diversity and the ability to put aside differences – to realize the value of working together – are other key features of their success. Then, there is the willingness amongst participants to learn new skills, like speaking with the media or politicians, or conducting research on their own. It was important for the community to be willing to take these on. And they did, to resounding success. When community members see others putting so much effort into something for the community, it is inspiring. Also, the people of the community saw COAST members “down in London for yet another meeting,” then coming back and doing talks at the local high school. Not just being active but being seen to be active. What happened here, Manuela says, has built the trust that now exists between the community and this team, a trust that has fueled their success. A few years ago, COAST realized that they were receiving a lot of requests from other coastal community groups asking for speakers to come and talk to them about what COAST was doing. It was apparent that theirs wasn’t the only community interested in establishing a local NTZ. After beginning to take these requests on, they quickly came to the conclusion that they simply did not have the capacity, and potentially not even the authority, to go out and tell to others what needed to be done. Each place has its own issues, and each community must discover their own pathway. So they partnered with Fauna & Flora International, who then created a hired role called Marine Community Support Officer (MCSO). The goal of this person would be to aid interested communities in developing ways to care for and protect their seas. That first and still current MCSO was hired in June, 2014, and she is Kerri Whiteside. Upon being hired, Kerri went to meet with various community groups to find out what they required and how she could help. That help entailed giving advice, writing up project papers and anything else she could support them with. Within a couple years, six or seven fellow community groups had formed in Scotland, with all but two being on the West Coast. Currently, there exists a network of a dozen partners who have formed the Coastal Communities Network (CCN), each doing very interesting work locally. One question Manuela is sometimes asked is, “What makes a coastal community?” She says it is difficult to answer, but that for their ever-growing network, they are defined by their determination to change their situation for the better. Not just through education and research but also, and perhaps most importantly, by campaigning. She brings up not only the many pollution and disease aspects of that industry, but also a social aspect. “We are unhappy that it’s called ‘Scottish Salmon,’ what they produce. Because 90% of the fish don’t come from Scotland, they come from Norway.” Not only are Scottish consumers often unaware that the “Scottish salmon” they buy at the supermarket was raised in chemical-laden toilet water and is rife with diseases and parasites that spread to and kill off the wild stock, but it is also incorrectly labelled and not even technically from Scotland. As with everywhere open pen salmon farming takes place, a key issue in Scotland is the polluting of the seas. Now they want to double that. Manuela says there is not enough knowledge about the effects on inshore marine areas from the pollution flowing from these salmon farms into surrounding waters, much less to be talking of doubling it. “It is completely out of the question without the proper risk assessments,” she states. She says, at the very least, groups such as those in her network deserve and need a seat at the table. A seat which does not yet exist. In a better future, Manuela says they would not even need MPAs because there would be sensible overall management of the sea. There would be an integrated approach where each bit of the sea had, as its stewards, the people of that area. Locals who would know what they have and have an interest in protecting it. They would simply be able to create protected areas to allow for full recovery, or to protect certain species, as science dictated. That is obviously a long way off, but it is the raison d’etre for CCN, for COAST, and for us here at Sealives: Reasonable management of the ocean and its resources, guided by science, economics, and a hope for future generations to retain a viable and necessary source of food and beauty. In some places, everyone needs to step back so that their kids and grandchildren can continue fishing. COAST and others in their network have started taking this step. At this point in time, though, without proper stewardship, the fishermen of the future look like they’re going to have to change careers before that career even begins. Read the full article COAST: A Marine Protection Success Story in Scotland – PART II at The Sealives Initiative. Read the preceeding article COAST: A Marine Protection Success Story in Scotland – PART I at The Sealives Initiative.